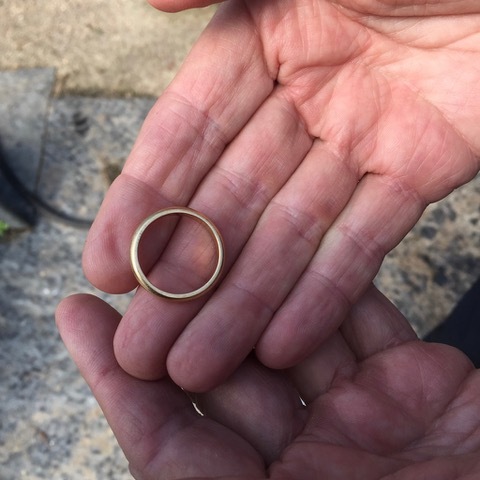 Have You Lost valuables, jewelry, keys, a wedding ring? 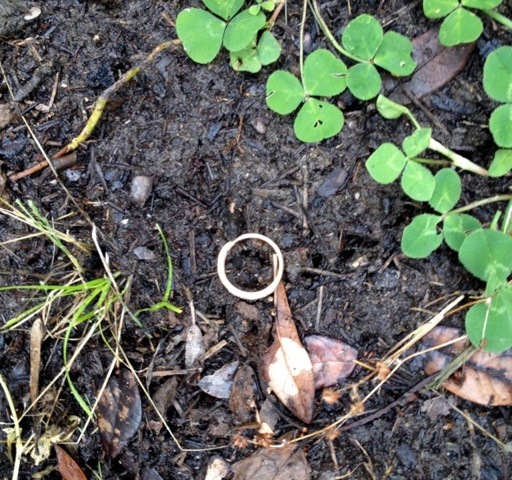 Forrest was so upset, he had just lost his beautiful hammered, rose gold wedding band in the back yard. 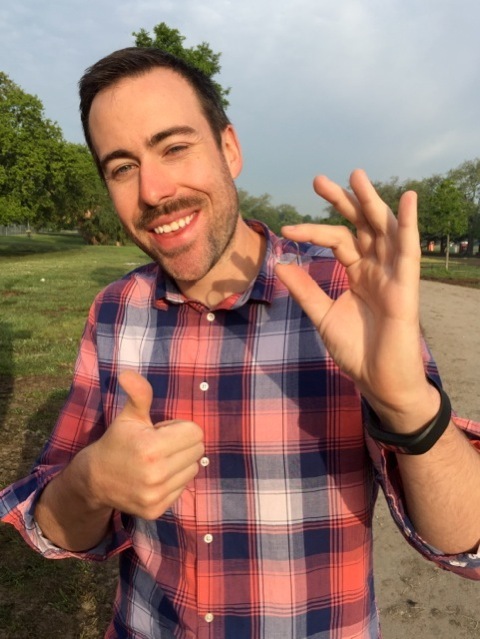 It flew off his finger while he was playing with his children. He looked and looked but no success so he called Cayenne Metal Detectors for help. After arriving at his home and doing my usual in depth interview, I had some idea where it night have gone and in fifteen minutes the XP Deus nailed it! Sure enough, it had flown backwards over his head, not forward, when he tossed his child in the air. 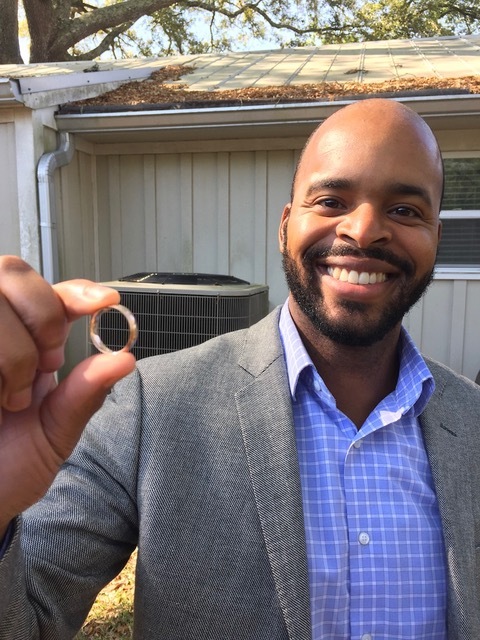 Forrest was all smiles and amazed the Deus had found his treasured wedding band so quickly. 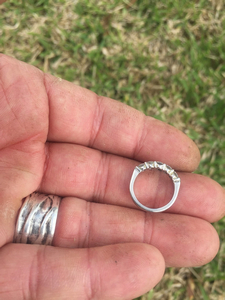 Chalk up another Cayenne ring finding success! 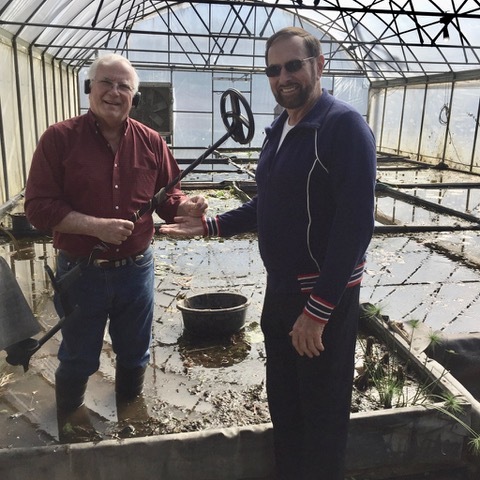 Well, on Thursday, January 25, 2018 it was DeJa’ Vu all over again for me and Richard Sacher, the owner of American Aquatic Gardens. 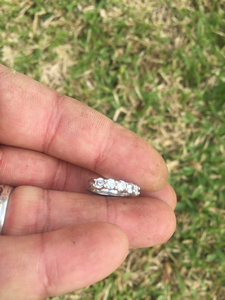 Last year on January 25th he e-mailed for help, he had lost his Cartier wedding ring somewhere in a pile of rocks and dirt while building a new pond. It took me about 10 minutes to find it with the remarkable XP Deus detector. Amazingly, this year on January 24th he called me to say he had had lost his ring again while working in the nasty muck and gradu of a lilly pad pond. I told him I could come the next day and if he actually lost it there, I was confident I could find it. At that point neither of us realized the significance of the date. So, on the afternoon of Thursday January 25th I headed to American Aquatic Gardens and after a brief interview with Richard about where in the lilly pad pond he thought he lost his wedding ring I stepped into the muck. 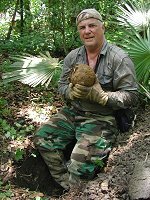 Now, if you have never hunted in a lilly pad pond filled with dead vegetation, fish and and long strings of roots and dead plant material, you are in for a real treat: it pulls at your boots, it stinks and trying to use a hand scoop is near impossible. Having said that, the XP Deus sniffed it out in 15 minutes, it was under the muck at the very bottom of the pond resting on the liner. It rang out a nice rock sold repeatable “84” using the Deus Fast program in 17 khz with only two tones and the hand scoop swept it up in one quick motion. 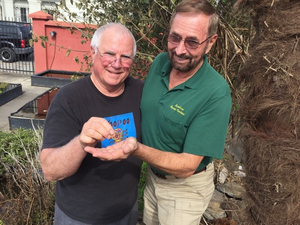 When I walked into Richard’s office with the wedding band he broke into a big smile and exclaimed, “ You will never believe this but it was last year on this very day you found this ring in the other pond.” At that point I conferred “Frequent Flyer Status” on Richard and he named me “Lord of the Rings” ! 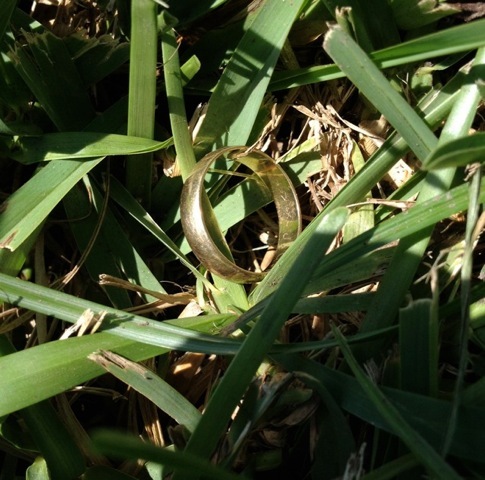 It was a lovely wedding reception on the family lawn except, the bride lost her diamond and platinum wedding ring in the grass while untangling her hair from her engagement ring. After a couple of days of fruitless searching they called Cayenne Metal Detectors for help. 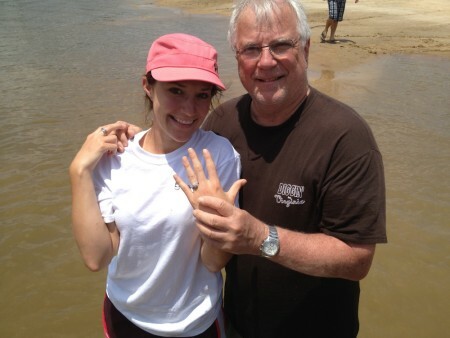 Within 40 minutes the ring was located and that big smile was back on the lovely bride’s face. The owner of American Aquatic Gardens, Richard Sacher, was really upset when he e-mailed for help. 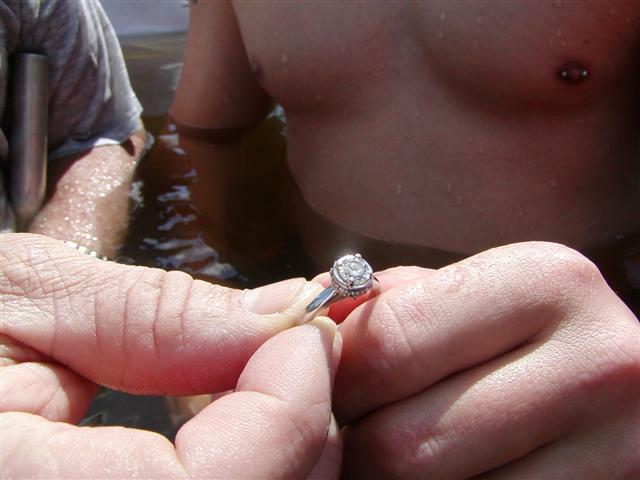 He lost his brand new Cartier wedding band while working on a few ponds and a waterfall mound at his business. 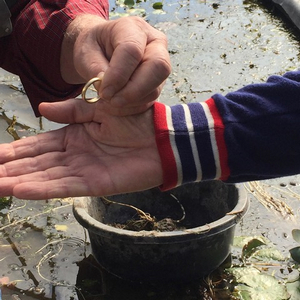 He drained the ponds, raked out the muck but alas no ring. He searched around the waterfall mound but again, no luck. So, he e-mailed for help. After a brief tour of suspected “ring eating areas”, the XP DEUS and I went to work and within about 10 minutes, the Deus sounded off a nice high number over a rock at the waterfall mound. 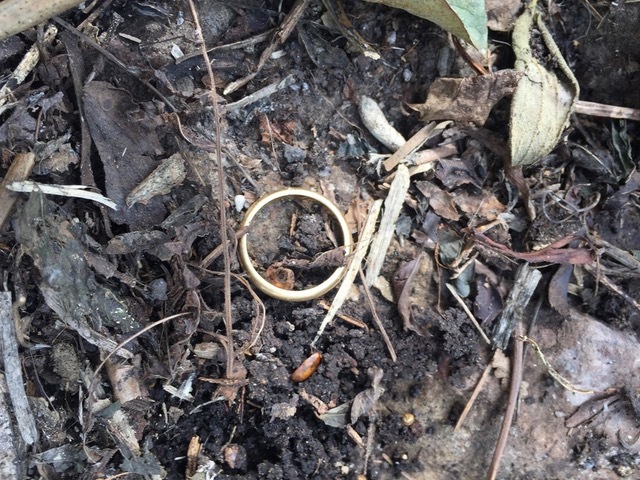 Moving the rock, there was a nice flash of gold snuggled in a crevasse of leaves and wood chips, the lost ring! Richard was sitting at his desk when I walked back to his office. 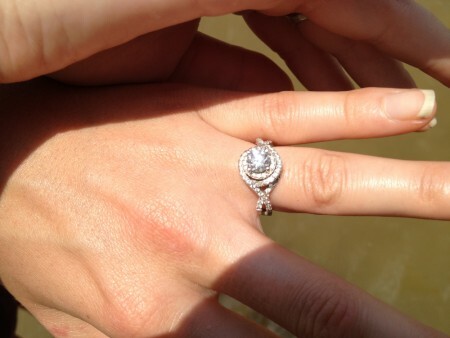 He looked up curiously and I held up the ring. The look on his face was priceless, happy, relieved and stunned I had found it so quickly and so was I! 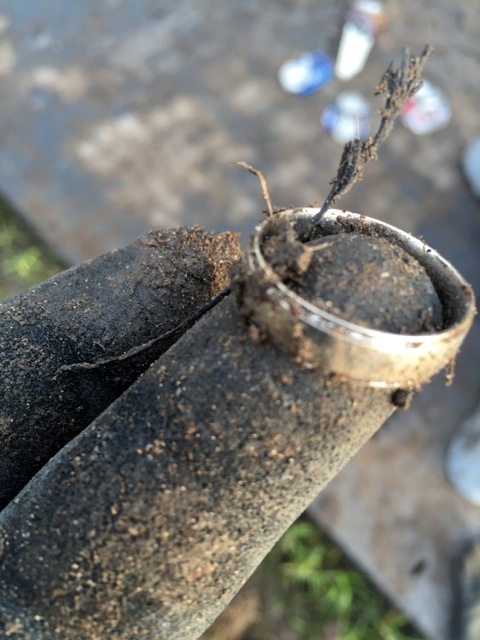 "Mark thought his wedding band was lost forever in the mud but the Deus nailed it 5 inches down!" "Ana called me this morning to help her distraught Mom. 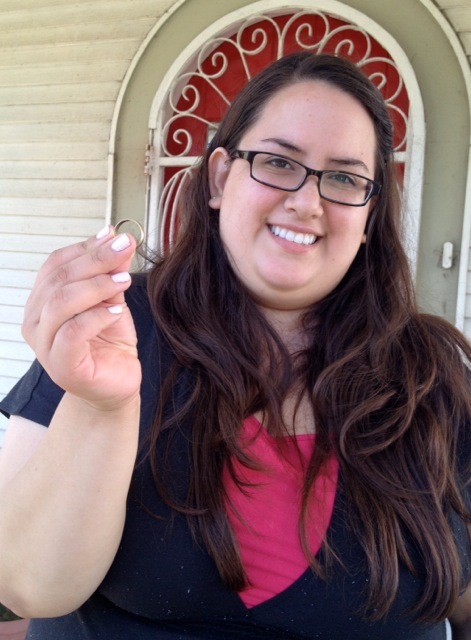 She had lost her ring while gardening and look though she may, neither Ana nor her Mom could find it. After talking with Ana's Mom, I selected an area to search and "Bingo" hit it on the first swing! First time that has happened. Ana and Mom are happy and Cayenne chalks up another success! " 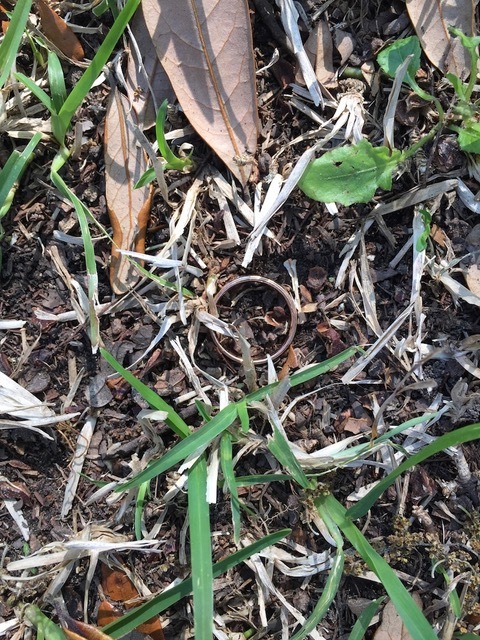 I lost my heirloom diamond wedding band somewhere on the 1 ¾ mile walking trail in City Park. I called Mr. Angelico the day after I lost it and met him at City Park. 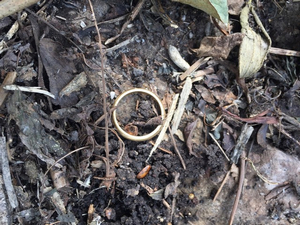 I retraced my steps on the trail with him, and he found the ring within half an hour!! A lady called today very upset, asking for help. 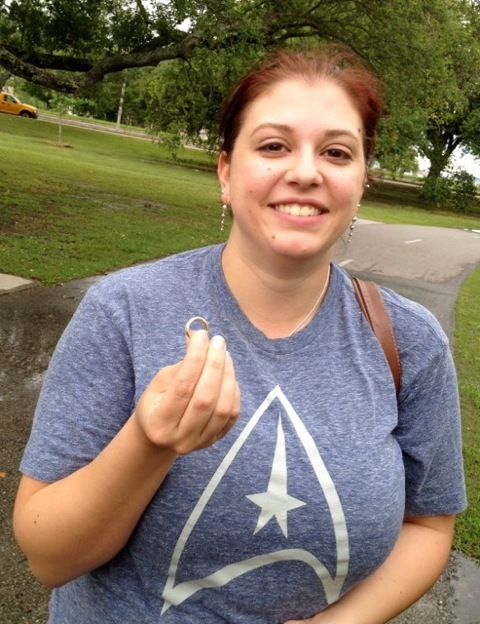 She had lost a family treasure, her Grandmother's gold and diamond ring while walking the big jogging path at City Park. She asked if I could find it with a metal detector? Sure, I said, if it's still there and someone hasn't found it already and sold it for scrap. So at 5:30 p.m. I met her at the Museum of Art. 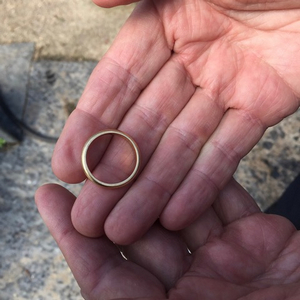 She told me she was wearing the ring on a gold chain around her neck and at some point the chain must have broke and the ring tumbled away. I told her, " Before I get my detector out, let's walk the route you took first. I want you to tell me everything you did and when and where you first noticed it was gone?" She said OK and away we went. 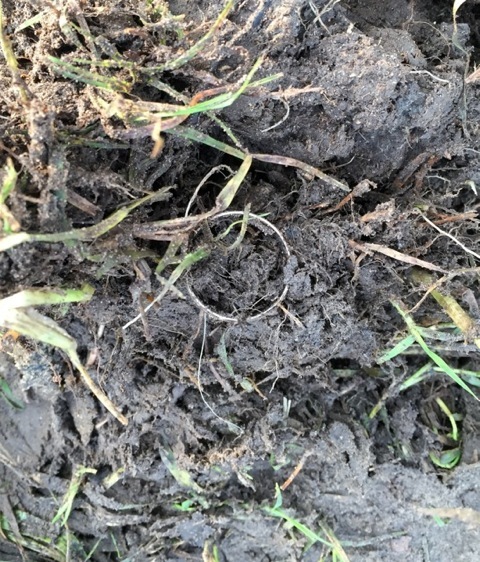 As she talked and we walked along I kept looking at the ground and the grass along the side of the path. She asked, " What are you looking for, we searched all of this all day long yesterday?" I said I was looking for anomalies, things out of the ordinary, different shapes that jump out at you as not belonging there and pointed out a few scraps of tin foil in the grass she didn't notice. 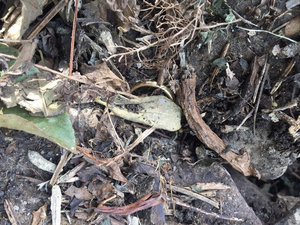 Then, about 20 minutes into our walk , the biggest anomaly of all popped out, it was right there in a patch of mulch and clover about a foot off the concrete path: A nice gold circle studded with diamonds!! 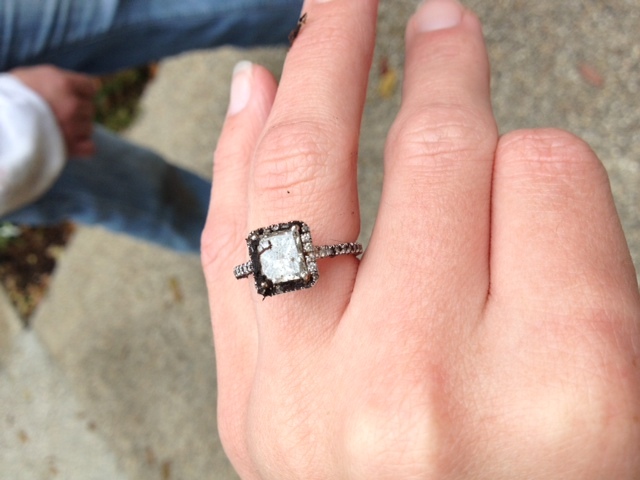 I bent down and picked up her Grandmother's ring and handed it to her. The poor lady almost passed out!! She could not believe I had found her ring without getting my detector out and I got a great big hug. In fact, two hugs! 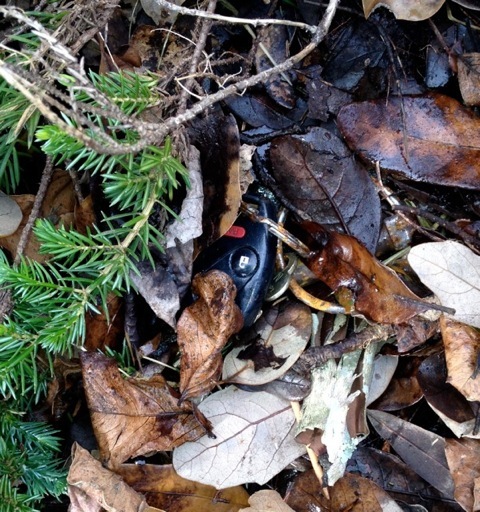 The best part is, she was certain she had lost it in the grass near the entrance to the park some distance away. That's when she first noticed it was gone. But, as simple as it sounds, that's why things are lost because really, we have no idea where they are. 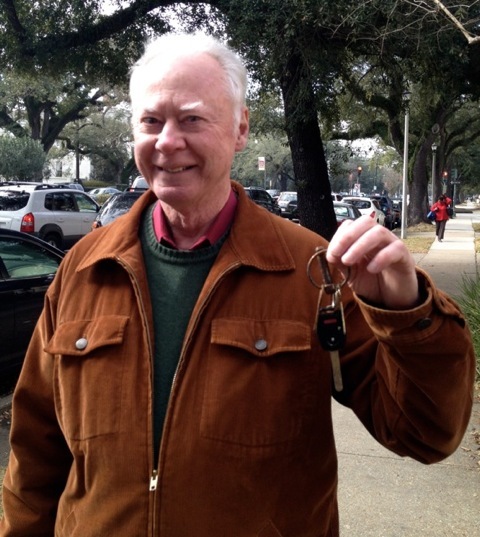 John searched for hours and couldn't find his lost keys so he called us. 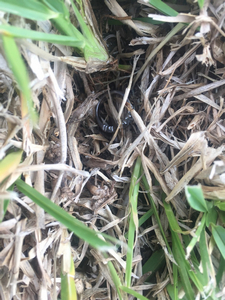 We found them in 10 minutes. 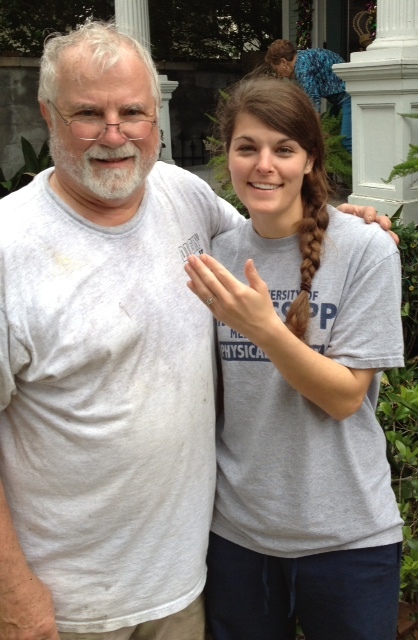 A very happy Mattie Smith gets back her beautiful 3.5 carat engagement ring after losing it during Mardi Gras in a thickly planted garden loaded with pipes, wires, extension cords and lights not to mention loads of trash. Total time to find it? 1 hour and 23 minutes using a hand held probe. 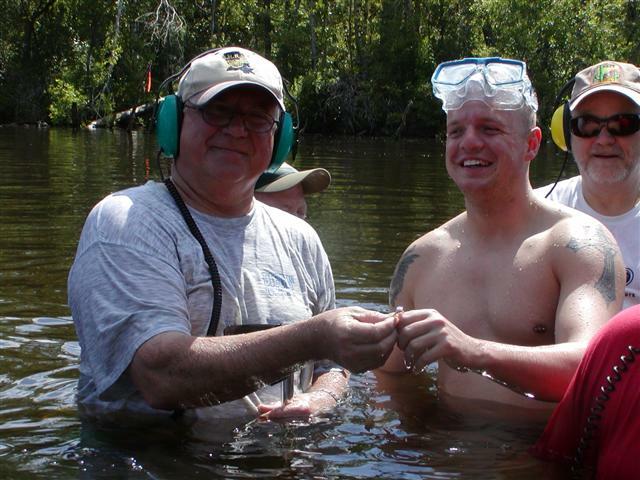 Happy Airman gets back his wife's lost engagement ring she lost while celebrating 4th of July in Jordan River. in a very muddy river where she had lost it.